* Internet Presale- Barry Manilow. 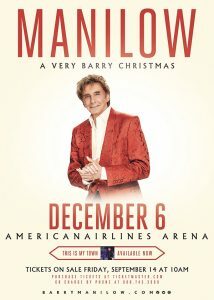 Barry Manilow will be performing live at AmericanAirlines Arena on Thursday, December 6, 2018 at 7:30pm. There will be a venue presale Thursday, September 13 from 10:00am to 10:00pm. Use the password “HOLIDAY” to access the presale. Tickets go on sale to the general public on Friday, September 14 at 10:00am at ticketmaster.com.